Wycliffe and the House of Fear by W J Burley. Like the other Wycliffe books this is set in Cornwall. Detective Superintendent Wycliffe is on holiday recuperating from an illness when he meets the intriguing Kemp family and visits Kellycoryk, their decaying ancestral home. The Kemps’ behaviour is odd to say the least and when Roger Kemp’s second wife, Bridget disappears people remember that his first wife had also disappeared in what had been assumed was a boating accident. Wycliffe is inevitably drawn into the investigation. I have yet to read a Wycliffe book and be disappointed and this one is no exception. It’s a complex story with sinister undercurrents and good depiction of a dysfunctional family. It kept me guessing almost to the end. This fits into the ‘Mystery’ category. The next one I read is the short story (just 27 pages), The Yellow Wallpaper by Charlotte Perkins Gilman, which is definitely a suspense story of a young woman slowly but surely losing her mind – or is it a case of a woman suffering from post-natal depression most cruelly treated by her doctor husband? Her husband believes she has just a ‘slight hysterical tendency‘ and prescribes rest and sleep, scoffing at what he considers are her fantasies. The un-named woman has just had a baby, which she is unable to bear to be near her. She spends most of her time in an attic bedroom, with barred windows and a bed fixed to the floor. The walls are covered in a hideous yellow wallpaper which has been torn off in places. It’s not a beautiful yellow like buttercups but it makes her think of old, foul bad yellow things – and it smells. The pattern is tortuous and she sees a woman trapped behind the wallpaper as though behind bars, crawling and shaking the pattern attempting to escape. Definitely a creepy and disturbing story! 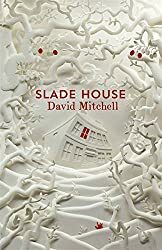 It reminded me of Marghanita Laski’s The Victorian Chaise-Longue with a similar sense of claustrophobia and helplessness. But The Yellow Wallpaper is much more horrific and by the end I began to question just what was real and what was imagination – it’s psychologically scary! These two are both books from my to-be-read piles.